At low wall thickness only 1-2 threads can often be introduced. But these are often not appropriate for a viable thread. I´m pleased that you are visiting our new website. Let yourself be inspired to work professionally and quickly with the Thermdrill® process. Thermdrill® threaded bushings are the best way to establish a releaseable screw connection in thin-walled materials. In the prefabriction Thermdrill® is the more elegant solution and replaces in many cases the traditional joining techniques such as welding and rivet nuts. With the Thermdrill® method you create in seconds with only two steps extremely stable threaded bushings made out of one piece. Thermdrill® is specially grinded and made out of solid carbide. Generating friction heat while drilling it displaces the thin walled material without producing any chips. Within seconds it forms a bushing underneath the workpiece from the existing material. While thread forming the threads are forced into the material by a non-cutting method. The material is cold worked and compacted as forging without destroying the natural grain (fiber-running) of the material. Formed threads are characterized by extremly high strength and smooth threads followed by a very good assemply of the screw and loosening torque of the screw. The finished treaded bushing has now 4-5 threads and is immediately usable. Made out of one piece it is 100% twist-free and provides a secure hold especially when it is used with dynamic load and vibrations. This vivid video shows the production of thermo-drilled and threaded bushings including their wide range of applications. Thermdrill® works just like normal drilling. Figure show the first step for the preparation of a bushing by the Ontool CEO Oliver Waldmann. With Thermdrill® you always get the best quality – made in Germany! Figure shows the verification of a thermo-drilled bushing with a plug gauge. They are made of one piece from the existing material and cannot loose anymore. It´s the ideal solution for thin sheet metal, pipes and profiles. No more wobble, loosening or twist (like with rivet nuts). 100% no twist because it´s made out of one piece. No additonal attachments required anymore. Especially suitable for round tubes. Secure hold also for sheet metal and special section tubes. No waste because of chipless process by using friction heat. 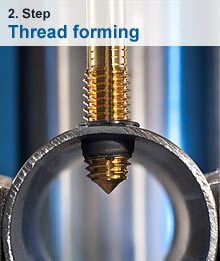 Better quality of the thread by thread forming instead of cutting (material solidification). Long life of the tools by polygonal grinded hard metal. As with forging the material gets extremely compressed while forming the thread. Therefore threaded bushing are particularily suitable for extraordinary loads. 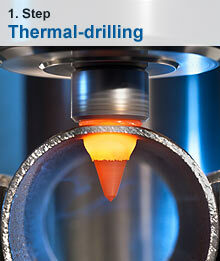 Working with Thermdrill® gives you a significant increase of productivity by reduction of production time up to 50%. Only two steps – i.e. just one tool change. High speed process – thermal drilling and tapping take only a few seconds. Increase of productivity through faster cycle times. Production costs can be saved. Flexible use as only one tool is needed for aluminum, copper, brasse, steel and stainless steel. The Thermdrill® Quick-Tool-Change device allows you to change from drilling to tapping within seconds in the same position. With Thermdrill® technology you can reduce up to 70% of material and labor costs for threaded connections in thin sheet metalum and increase simultaneously productivity. Production of M8 threaded bushings to connect glas-holders with round posts. Up to 90% less material costs due to high life time of the tools. Up to 50% less labor costs through high speed process and fewer tool changes. Usually no investment in drilling machines required – can be used on almost any standard pillar drills. Modular system allows you to buy only the tools that you need for your application. 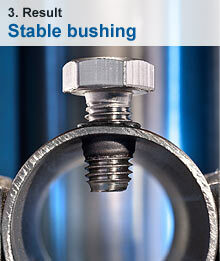 Reduction of rejects – no loosening, wobbling and twist like rivet nuts. No consequential cost due to broken connections. Thermdrill® thermo-drills and thread formers are very durable. A single Thermdrill® tool-set replaces up to 5.000 rivet nuts.